Explore the Rural Park of Nublo and enjoy the nature on its purest condition. 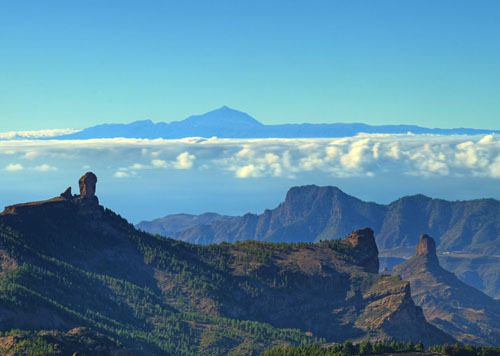 The Roque Nublo Rural Park is located on the heart of the island of Gran Canaria holding the municipalities of Artenara, Mogán, San Bartolomé de Tirajana, San Nicolás, Tejeda, Valleseco and Vega de San Mateo. In this park many native protected species inhabit. The wide pine trees, its puddles and coastal cliffs confer an exceptional beauty landscape. In this park is located the Pico de las Nieves, with 1.949 metres over the sea level, the highest point in Gran Canaria from where you might see an impressive panoramic view. Roque Nublo is a singular site and an emblematic symbol to Gran Canaria. This colossal rock was adored by old aboriginal. You’ll be able to access through the base by a steep ground trail. It’s important to mention that this place usually has a natural phenomenon known as the “Sea of Waves” which stagnate on the north slope of the mountains. The south is usually clear. If you’re coming from the north you should climb to San Mateo and then follow to Cruz de Tejeda. You’ll find a junction to El Pico de Las Nieves and Tejeda. You should go to south by Fataga, San Bartolomé de Tirajana and Ayacata.